The American psychologist Edwin. G. Boring was a great admirer of Hermann von Helmholtz, to whom he dedicated his definitive textbook Sensation and Perception in the History of Experimental Psychology in 1942. In the specific area of colour, however, Boring was more inclined towards Ewald Hering who, as one of the leading cognitive psychologists of his time, had used his colour system from circa 1878 to argue that Leonardo da Vinci‘s ideas — involving six primary colours (two achromatic and four chromatic) — were correct. As proof, Hering never carried out experiments, preferring to investigate his own colour perception through the process of introspection. We nowadays call this «phenomenological analysis», the word «phenomenon» (literally, «appearing») therefore implying that a distinction must be drawn between an appearance and the event which that appearance proclaims. Hering’s colour system is therefore based on such an analysis. Edwin G. Boring is one of the few 20th century psychologists to have followed his example: in 1929, Boring proposed a double pyramid, the central plane of which fills a rectangle, and the corners of which are occupied by Hering’s four chromatic complementary colours of red (rosso) and green (verde), or yellow (giallo) and blue (blu). The achromatic colours white (bianco) and black (nero) are placed at the tips of the pyramids, with axes of increasing chromaticity extending outwards from the grey centre. 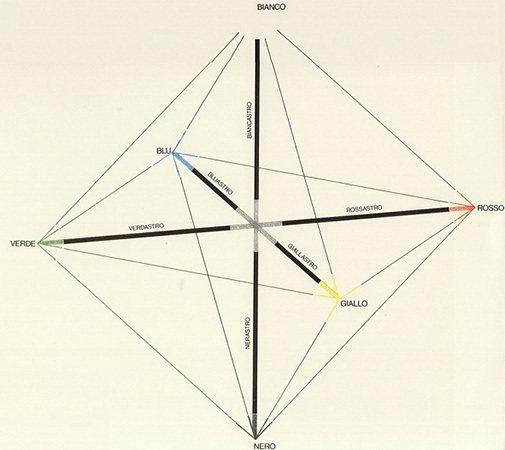 These are whiteness (biancastro), blackness (nerastro), redness (rossastro), yellowness (giallastro), greenness (verdastro) and blueness (bluastro) (illustration). In the 1950s, the psychologist F. L. Dimmick returned to Boring’s system in order to investigate the capacity of individuals to differentiate between colours. A high level of sensitivity is required from such test persons. He pointed out that, in this connection, the grey of the centre tends to separate more than it combines. As a result, Dimmick does not have an uninterrupted series running from black through to white, for example, or from red through to green; instead, he introduces two consecutive series, one running from black to grey and the other from grey to white, or from a primary colour to grey, or from grey to its complementary colour. Dimmick also uses the linguistic argument in support of this separation — ultimately, nobody refers to a blackish white although we can talk of blackish grey; and nobody knows of a greenish red, although we can all imagine greenish grey. Date: This phenomenological colour-solid by the American psychologist Edwin G. Boring dates from 1929. 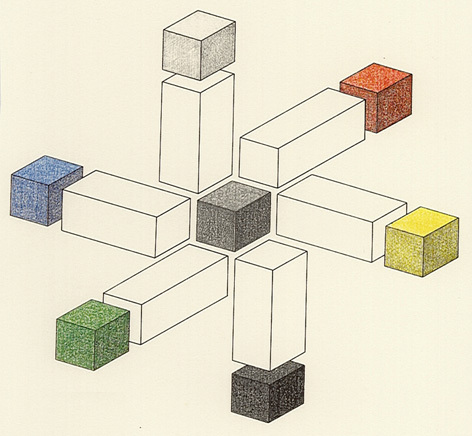 Bibliography: E. G. Boring, «Sensation and Perception in the History of Experimetal Psychology», New York 1942; S. Hesselgren, «Why Color Order Systems?», Color Research and Application 9, pp. 220-228 (1984); F. L. Dimmick, «Specification and calibration of the 1953 edition of the Inter-Society Color Council Color Aptitude Test», Journal of the Optical Society of America 46, pp. 389-393 (1956).